添好運點心專門点 Tin Ho Wan Dim Sum Specialty Shop, is opening their first overseas branch in Singapore at Plaza Singapura this week! Only did I realised that I had not blogged about our visit to their “flagship” shop in Mongkok 3 years back! Grr…. oh well… here it is better late than never! 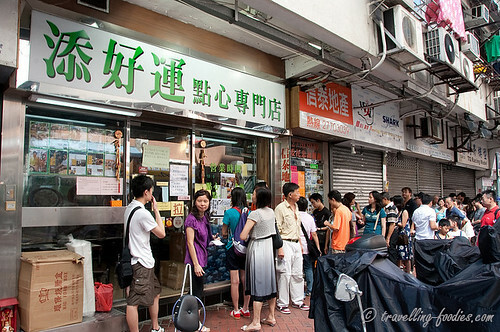 Tin Ho Wan was the hot topic of foodie forums and blogs a couple of years back when it was awarded a Michelin star. Overnight, they were suddenly on the “must-try” list of dim sum aficionados and visitors to Hong Kong. Since then, this little dim sum deli which had its humble beginnings under the void deck of a residential building in Mongkok which could barely house two dozens of diners in one seating, rose to stardom and of course, was much under the limelight from both online and printed media as the “cheapest Michelin starred restaurant in the world”. Well, judging by how affordable dim sum generally is in Hong Kong, this is probably true. But is it doing enough to warrant its Michelin star, to be more than just being the cheapest?